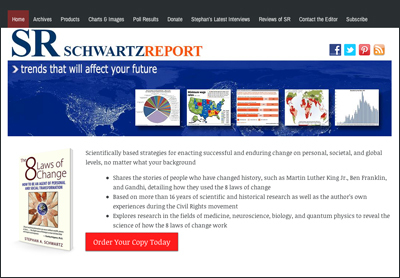 Schwartzreport is a daily publication in favor of the earth, the inter-connectedness and interdependence of all life, democracy, liberty, and things that are life affirming. It also warns readers about actions, and events that threaten those values. Stories have been vetted for accuracy by either a significant peer reviewed research journal or, at the least, a major journalistic publication. SchwartzReport has been published daily seven days a week, 365 days a year since 1998, with only occasional interruptions caused by the absence of internet access. Although it usually issues from an island off the Northwestern American coast, SchwartzReport has also originated from camel caravansaries in Pakistan, boats in Northern Canadian and Alaskan waters, Native American kivas, beneath the Kremlin, ancient caves in Turkey, temples in China, and dozens of motels, hotels, and hot springs throughout the world.